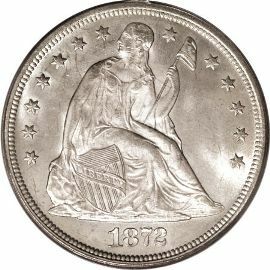 The Seated Liberty Dollar Type 2 (with Motto) was minted between 1866 and 1873. With the end of the American Revolution, and the devastation that came along with it, public sentiment turned to religion. This was the main reason the motto was added to the dollar and other US coins. Many options were submitted including "GOD OUR TRUST", "GOD AND OUR COUNTRY" and "IN GOD WE TRUST". Finally, in 1864 Secretary of the Treasury Salmon P. Chase selected "IN GOD WE TRUST" to appear on the nations coinage, and so it began with the two-cent piece. 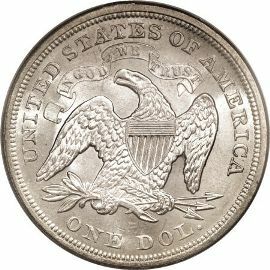 The obverse design of this silver dollar depicts Liberty seated on a boulder. She is grasping a pole in her left hand with a liberty cap on top. With her right hand she supports a union shield inscribed with the word "LIBERTY". Thirteen stars surround the entire design. denomination "ONE DOL." appears below.